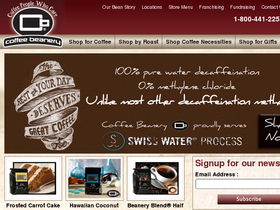 Coffee Beanery, online at CoffeeBeanery.com, offers specialty coffee from “the coffee people who care”. Coffee Beanery offers coffee in a variety of different roasts, a good selection of tea, and gift and accessories needed by every coffee-lover. These accessories include coffee makers, mugs, canisters, syrup, dessert drink mixes, grinders, and other essentials. Make your taste selection from flavored coffee, decaf coffee, origins/blends, organic/fair trade, rare coffee, best sellers, and coffee syrup. Head over to Coffee Beanery today, and remember to go to RetailSteal.com for all the greatest Coffee Beanery deals, Coffee Beanery promotions, and Coffee Beanery discounts. Coffee Beanery ships to any destination in the United States, but extra cost may apply for Alaska and Hawaii. This store flat rate shipping of $5.95. Save up to 50% on sale items at Coffee Beanery. Click link to shop and save. Enjoy a free sampler from Coffee Beanery when you sign up to receive their newsletter. Find coffee products on CoffeeBeanery.com for as low as $4.99. Click link now. Shop Coffee Beanery to find tea starting at $9.99. Click link now. Buy Caramel Apple Flavored Coffee at Coffee Beanery for only $11.99. Click link to purchase.